we check our calendar every morning (after we wish each other well). usually we are trying to figure out a pattern along with what number will come next. i’ve started drawing the month’s calendar each month instead of using a purchased one. i think i did that in february when i wanted to draw hearts around the number in different colors. 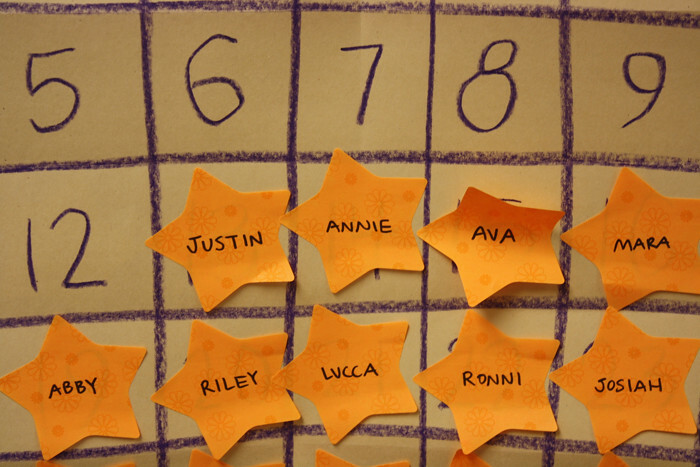 for may we hid the numbers with post it stars. when the child’s name was on the star, they came and took it off. my, my that was exciting. i think i’ll do that in september as well…perfect for when we’re trying to learn each other’s names. I love the idea! That’s why your preschoolers are so smart. :) By the way, I hope you told the Board how well your preschoolers did on their screenings. It is great data to share! what a simple but special treat for the kids!